The state of Brazil will be on trial at the Inter-American Court of Human Rights (IACourt HR) for the violation of the rights of the Xukuru people (Pernambuco, Brazil) this Tuesday March 21st. It is the first time that Brazil will be in the defendant’s bench in an international court for violations of the rights of indigenous people. During the trial the Inter-American Commission on Human Rights (the plaintiff), representatives of the victims and the State will present allegations. The trial will take place in Guatemala City starting at 12:00 pm (noon) (Brasilia – Brazil time). The court will analyze the violation of the right to collective property of the Xukuru of Ororuba’s indigenous people and its members as a result of the delay in the demarcation of their ancestral land and the ineffectiveness of the judicial protection intended to guarantee such right as well as the lack of effective and accessible judicial remedies. It will also hear about the violation of the right to personal integrity, all of which are protected by the American Convention on Human Rights. This Convention was ratified by Brazil in 1992. Between the beginning of the demarcation process, in 1989 and the ratification of the Xukuru indigenous territory, in 2001, Twelve years had passed. The registration of the Xukuru’s territory was only performed in Brazilian Legal Registry in 2005, four years later. However, to this date the State has not concluded the removal of non indigenous occupants from the area nor has it guaranteed property rights for the indigenous people, since they have still been suffering with the presence of non indigenous occupants on their demarcated territory. The case is even more significant because the problem has dragged on practically since the promulgation of the Federal Constitution in 1988, which theoretically should guarantee the rights of indigenous peoples. This case and process has been marked by violence and the criminalization of these indigenous people. Between 1992 and 2003, five Xukurus were killed, and their killings were directly related to their struggles for the right to land and territory. The conflict even made as a victim the public attorney for the The Brazilian National Indian Foundation (Funai). “This trial brings the possibility of a historical reparation in the process and struggle of the indigenous people for the territorial demarcation, which has cost the lives of many people. The State had all the conditions to advance the administrative process without having to expose Xukuru leadership to assassinations, violence and criminalization, but the state did not fulfil its obligations”, affirms the indigenous leader Cacique Marcos Xukuru, who will be present at the trial in Guatemala. Cacique Marcos Xukuru was the victim of an assassination attempt that result in the death of two other indigenous men. Cacique Marcos is the son of Cacique Xikão Xukuru an important indigenous leader assassinated in 1998. The Xukuru case was presented to the Inter-American Commission on Human Rights (IACHR) in 2002. In the merits report on the case, which was disclosed in July of 2015, the Commission concluded that the state of Brazil is internationally responsible for human rights violations against the Xukuru people and has made recommendations to the State of Brazil, none of which has been fulfilled until this time. For this reason, in March of 2016, the Inter-American Commission on Human Rights decided to submit the case to the Inter-American Court. The representatives of the Xukuru people in the Inter-American Court are “Movimento Nacional de Direitos Humanos (MNDH/Northeast Region)”, “Gabinete de Assessoria Jurídica às Organizações Populares (GAJOP)”, Conselho Indigenista Missionário (Cimi) and Justiça Global. This Tuesday’s hearing will be the first and only hearing during all the proceedings of this case. After the hearing, Representatives of the victims, the Inter-American Commission (plaintiff) and the State representatives will have until the 24th of April to present final written allegations in order for the court to give its verdict on the case either condemning or acquitting Brazil of the charges. The struggle of Xukuru people is an emblematic example of the challenges confronted by indigenous people in Brazil. The trial on the Inter-American Court also represents the recognition of the worsening of the violations of indigenous rights in Brazil. “Many indigenous peoples in Brazil wait 20 or 30 years while the demarcation processes drag on and result in violence and criminalization against indigenous peoples”, evaluates Cacique Marcos Xukuru. “There are a variety of actions that the state of Brazil has taken to make unfeasible the recognition of our territories and the realization of rights that we are entitled. Without a voice to confront the State, we are in a very vulnerable position. We can’t see another manner to resolve the situation without international pressure”. The Ororubá Serra in Pesqueira, Pernambuco, is a municipality nestled in the Vale do Ipojuca (a Valley) and has been the setting for more than three centuries of pillage and death of the Xukuru people. However, in the 1980’s this trajectory began to change. With the nomination of Xikão as a leader (Cacique), the Xukurus began to mobilize. After twenty years of struggle, in 2001 they finally got the ratification of 27,555 ha of land in which they live. These same lands that have seen the deaths of many indigenous is today home to 11 thousand indigenous that struggle on a daily basis against prejudice, violence and the survival to maintain alive the Xukuru culture. With the end of the Military regime and the democratic transition, the 1988 Constituent Assembly became the center of the struggle of the indigenous movement. 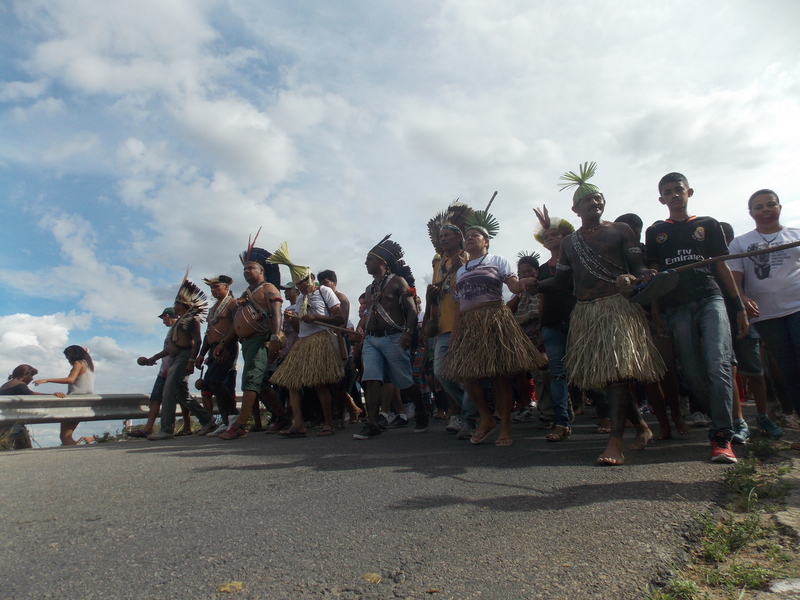 In Brasilia, Xikão and other important indigenous leaders and supporters or promoters of indigenous rights ran through offices, rallied supporters, discussed proposals, organized demonstrations and, in the end, saw the native rights of indigenous peoples to their traditional lands enter into the new constitution. The victory invigorated the Xukurus and in 1990 they began to take back parts of their traditional territory, while they waited for the demarcation of their land by the State. During the 1990s, due to the delays in the territorial demarcation, a succession of re-integrations led the farmers to react. In 1992 Paje Zequinha’s son was assassinated and in 1995 the the association’s lawyer, Geraldo Rolim also a public attorney of Funai was gunned down by a series of bullets in his back. Xikão always believed that the basis for change of his group was in education and organization. Xikão promoted the creation of health and education commissions in the villages as well as the Xukuru Association. A system that is still functioning today and stimulates the participation of indigenous people in the group’s decisions, which are generally discussed in assemblies and seminars. In the morning of May 20th 1998, Xikão left his home in the Xukuru neighborhood of Pesqueira, when he noticed the arrival of a gunman. He didn’t have a chance to defend himself. Xikão’s assassination had international repercussion and mobilized his people. Three years later, the leader of the Pé de Serra community, Mr. Chico Quelé was also assassinated. On February 7th 2003, two years after the ratification of the Xukuru’s territory, history would it repeat itself once more. An assassination attempt against Cacique Marcos, son and successor of Cacique Xikão resulted in the death of two indigenous men while acting as security for Marcos. Finding out about the assassination attempt, the Xukuru people reacted. On the eve of that year’s carnival, a trail of smoke in the sky indicated that the Vila de Cimbres had been taken over by the Xukuru, 300 years after its building on the indigenous peoples’ sacred territory by the Portuguese settlers. The reaction of the Xukuru resulted in the conviction of 31 indigenous including Cacique Marcos to a prison sentence of 1four years. The investigations and denunciations affirmed that Marcos armed the attack and the death of two indigenous that were responsible for his security to sharpen the revolt upon the town and the expulsion of the non-indigenous families from the village. Cacique Marcos had his sentence reduced to t four years by the 5th Regional Federal Court (TRF-5). The same strategy of criminalization happened in the investigations of the assassination of Cacique Xikão and Chico Quelé, for which indigenous Xukuru were blamed for the assassinations. Sixteen years after the ratification of the Xukuru Indigenous Land, the Brazilian State has still not yet ensured the total removal of the non indigenous occupants of the area.